Above: The Top 3 guys from GIC are relatives until quite recently. 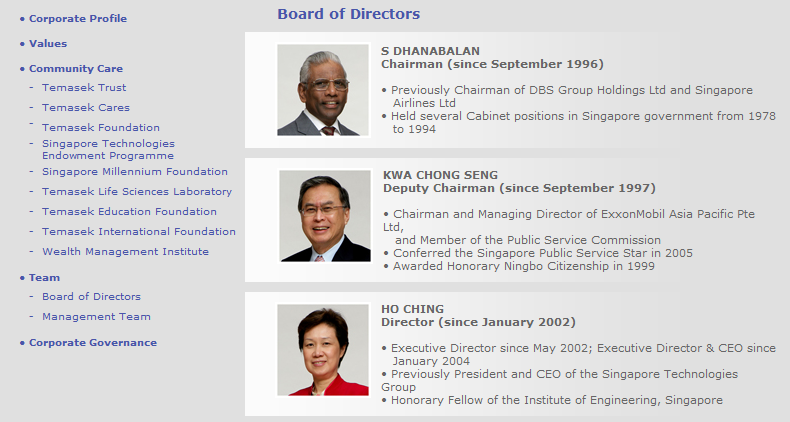 LKY is the chairman, LHL deputy-chair, and their relative Tony Tan is CEO of GIC. 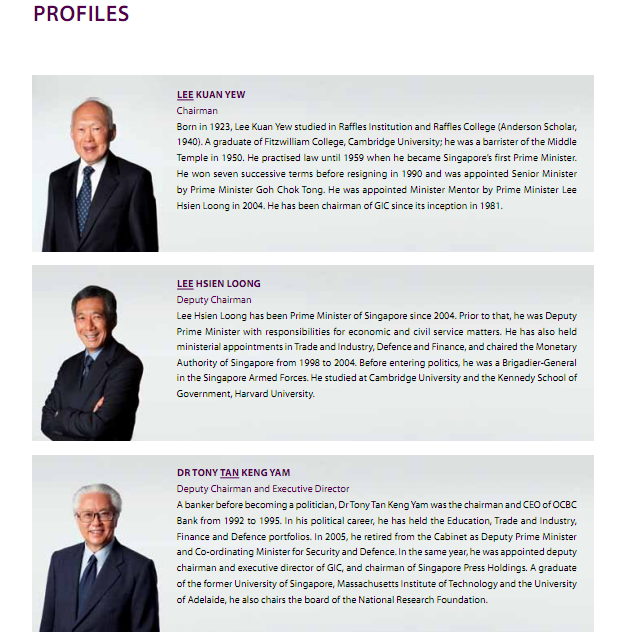 Meanwhile the deputy-chairman and CEO of Temasek holdings, Kwa Chong Seng (nephew of Lee Kuan Yew), and Ho Ching are relatives of Lee Kuan Yew as well. Very recently, GIC see some changes in management, with the resignation of Tony Tan, promotion of Lee Hsien Loong to chairman. Even though Lee Kuan Yew forgo his cabinet position, he has not dumped GIC entirely. He is currently holding the position of GIC special advisor. The Lee family seem to be particularly interested in keeping the control of Singapore's wealth within their family. Not even President Marcos or Suharto were able to have such a firm grip on the purse string of their nation. It is very difficult to see, how a nation can entrust their entire wealth to a single family, without ending up in disaster. How GIC and Temasek are run is still a big mystery. When late president Ong Teng Chong tried helping us to find information about our reserves, he got into a big fight with PAP. Given Tony Tan's business in GIC and family ties with Lee family, it will not be difficult to see the existence of conflict of interest if Tony Tan become the president. It is likely that he will not be able to properly discharge his duty if he is elected.